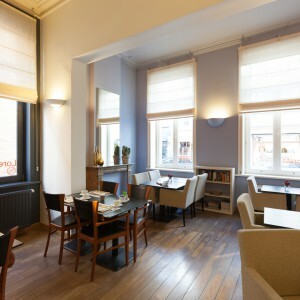 Hotel Loreto is a welcoming family hotel in the heart of Bruges, near the station. The 18th century mansion is completely renovated and radiates elegance and comfort, all rooms are spacious and equipped with all mod cons. Liesbeth and her team will give you a warm welcome! Whether you come to Bruges alone, with a friend or partner, or with your family, Hotel Loreto has 10 spacious rooms with all mod cons. Every room has its own luxury bathroom with a bath tub, digital television, radio, telephone, mini bar and safe. Hotel Loreto is located in the historic centre of the city, at walking distance from the main attractions and easy to reach from Bruges station. An underground car park is located just 150 m down the road. There is a lift at the hotel. The name “Loreto” refers to the statue of the virgin Maria on the hotel façade and refers to the Madonna of Loreto, patron saint of aviators. The Double room is a large room for two equipped with all mod cons. The warm colours and high ceilings guarantee a cosy and domestic atmosphere. A lift is available for all rooms from the first floor and up. A double bed is standard available, twin beds available on request. Are you looking for a hotel with an excellent price and quality ratio to stay overnight in Bruges, then you have come to the right place. We are already looking forward to welcoming you! The Triple room is a comfortable room for three persons with one double bed and one single bed, ideal for families. Three single beds can also be set up on request. The warm colours ensure a cosy and domestic atmosphere, the high ceilings and large windows give you a feeling of space. Are you looking for a hotel with an excellent price and quality ratio to stay overnight in Bruges, then you have come to the right place. We are already looking forward to welcoming you!